CLEVELAND, Ohio–Researchers at Case Western Reserve University and two other universities have discovered the 13-million-year-old fossils of a pair of new species of extinct hoofed mammals known as "litopterns" from a site in Bolivia. 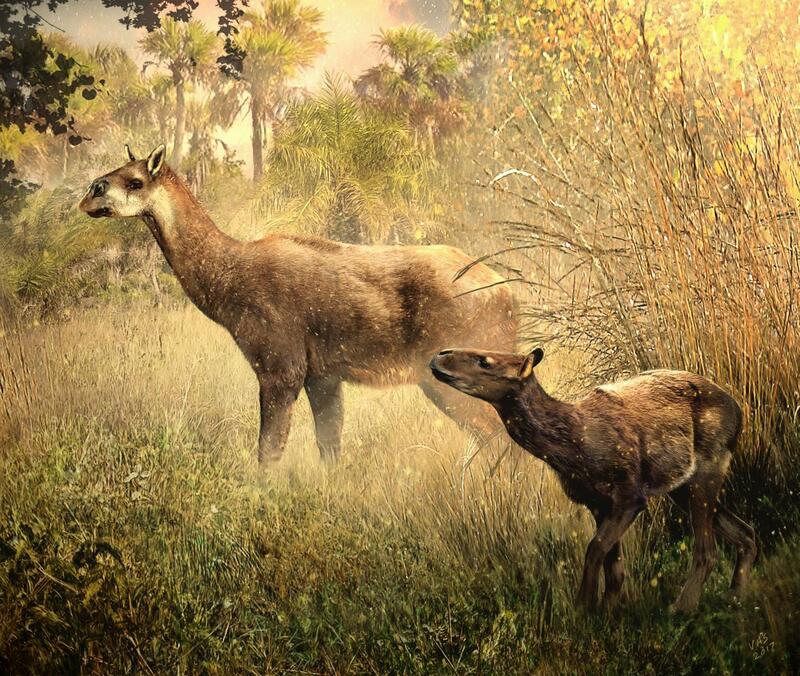 The animals, which look similar to small moose or deer in a paleoartist's rendering, are being dubbed Theosodon arozquetai and Llullataruca shockeyi, ungulates native only to Bolivia. They lived in the latter part of the middle Miocene epoch, a time interval from which relatively few fossils have been collected in South America. The discoveries, announced in the June edition of the Journal of Vertebrate Paleontology, are important not only because they document two species previously unknown to science, but also because they come from the tropical latitudes of South America. The northern half of South America harbors a rich diversity of living mammals, but is a difficult place to find fossils of them. "Studying fossils from regions such as Bolivia, where few others have looked, has allowed us discover and describe a variety of new species that are changing our views about the history of South America's mammals," said Darin Croft, a biology professor at Case Western Reserve, who co-led the expeditions that recovered the fossils. The lead author on the journal publication was one of Croft's former students, Case Western Reserve graduate Andrew McGrath, who is now studying this group of animals for his PhD at the University of California-Santa Barbara. "These new species hint at what might be hiding in the northern parts of South America," McGrath said. "For example, close relatives of Llullataruca disappeared from southern South America around 20 million years ago, but based on our research, we now know they were able to persist some seven million years longer in Bolivia and northern South America than in Patagonia." Federico Anaya of Bolivia's Universidad Autónoma "Tomas Frías" in Potosí also collaborated on the project. Croft and Anaya have been working together in Bolivia for more than 15 years. Croft, who has a primary appointment in anatomy at the School of Medicine, is considered one of the world's leaders in neotropical paleomammalogy, the study of South America's prehistoric mammals. Since South America was geographically isolated for most of the past 66 million years, its rich fossil record makes it a perfect location to "investigate topics such as mammal adaptation, diversification, and community ecology," according to his website. Some of that work was covered in his 2016 book with Chicago-based artist Velizar Simeonovski, Horned Armadillos and Rafting Monkeys: The Fascinating Fossil Mammals of South America, which received an Independent Publisher Book Awards gold medal in science in 2017. "South America was untouched by mammals from other continents for millions of years, so the solutions its native mammals came up with were often different from those developed by mammals elsewhere," he said. "By comparing how mammals on different continents have evolved to deal with similar ecological situations, we are able to gauge which characteristics developed due to universal ecological principles and which were peculiar to a certain place and time." Recently, Croft and collaborators explored that question by digging further into the mysteries of how some 11 species of mammals known as "sparassodonts"-extinct weasel-to-jaguar-sized meat-eating marsupials-were able to co-exist during the early Miocene (about 18 million years ago) in southern Argentina. The research has left Croft and others wrestling with what he calls a "carnivore conundrum." In short, they are being challenged by findings that suggest that either all ancient carnivorous sparassodonts were crammed into a very narrow meat-eating niche (think mountain lion)–or some were actually omnivores (think raccoon), but had teeth that did not reflect their varied diet. That scenario "would challenge a fundamental principle of paleoecological reconstruction," Croft said in a recent blog post summarizing what was detailed extensively in a paper earlier this year. "Could it be that their teeth are leading us astray?"